I type these words mere minutes after completing an indie game by the name of Limbo. 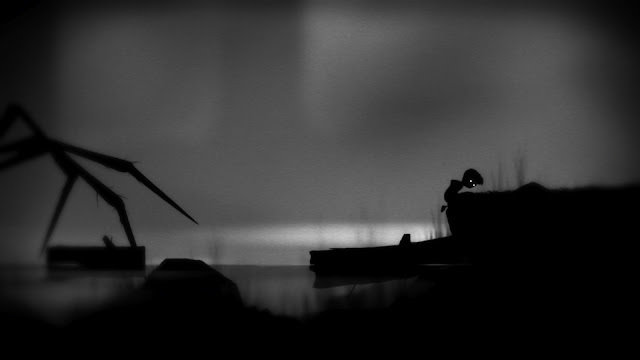 While you may or may not have heard of the developers, Playdead, you've likely heard of Limbo. You know, it's that game about the kid and the silhouettes and the giant spider. Coincidentally, tomorrow marks the game being out for two whole years, but I only just got around to playing it. Nevertheless, I thought I would post some thoughts on the game, because it is an interesting one indeed. It's not particularly long, taking about three hours to beat, but given the length of triple A titles these days, that's not so bad for an indie game. Of course I already said some things over on my Twitter, but surprisingly enough, it's kind of hard to ramble on the way I do in a mere 140 characters. So, read on for the long version! 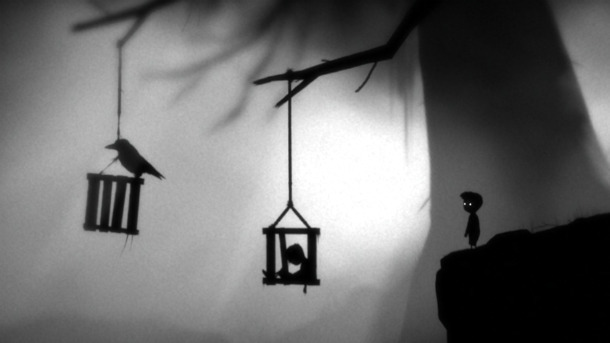 Thing thing that has to be said the most about Limbo is that it absolutely nails it's aesthetic. In a world composed only of silhouettes and grainy grey light, it's painfully obvious from moment one that this is a dark and lonely world. This fact is only strengthened by the fact that as soon as you start a new game you are simply left to your own devices. There is no intro, no text, no dialogue, all you can do is head onward without the slightest clue who - or where - you are. However despite the extremely monotone and materialistic art style, the game surprisingly never has any issue with an object being indecipherable, and the only times when something is hard to see is when it is intentionally so. As far as the actual gameplay goes, everything moves very fluidly and the game's physics, while simplistic, work pretty well to give the impression of a living world. In a realm where even giant spiders move with the utmost smoothness, it's pretty easy to feel like everything is bigger and meaner than you, and out to kill you. The one gripe I have is that controlling the game with the keyboard feels a tad stilted. The largest issue is that the up arrow controls both ascending and jumping. This is not always an issue, but occasionally it leads to frustration, especially when trying to quickly jump about or maneuver boxes. I can't comment on playing with a controller, but I would assume doing so would minimize, or even negate completely this issue. Now let's talk about what exactly Limbo is. Essentially it is a puzzle platformer. As mentioned, you are never given any goals or backstory, all you know is that you have to keep moving forward, because hey, that's what you do in video games. To add to the game's very dark and gloomy feel, pretty much everywhere you go there is some form of death trap, and it's your job to use your entirely unimpressive array of abilities to get past them without dying. For the most part this works pretty well. The game does a good job of keeping things interesting and gradually giving you more and more complex challenges that are hard enough to be rewarding, but never frustrating. What's more, because all you can really do is run, jump, and grab/pull/push things, it really feels like you are using nothing but your wits to conquer the environment. With all of that said however, I do take some issues with the game. First off, it doesn't really do that well in terms of pacing. This is a very subtle issue that many people may not even notice, especially if they don't play through the game in a single 3 hour sitting like I did. The issue is simply that there is nothing to break up the game. You are always moving right facing one challenge after another. The biggest break you get is when you have to walk several seconds along an empty area to reach the next obstacle. While certainly not a big issue, it felt to me like there was just never any distractions or interesting diversions. The game isn't particularly fast paced so perhaps they aren't necessarily needed, and it may well have bee a conscious choice to never let the player rest. It simply felt a little off to me that I never really got any time to revel in my victories, and even after beating the game I never felt like the game rewarded me at all. In addition to this, I feel like the first half or so of the game is much better than the latter half. The puzzles certainly aren't as interesting, but that's largely superfluous. The issue to me is that in the first half of the game, it feels like the world is alive and full of things looking to kill you. You spend a pretty large amount of time repeatedly meeting the same giant spider which is so frequently associated with the game. On top of this you actually meet other people. They don't say anything, in fact they are trying to kill you for some reason, but they are living things. In the second half of the game you are essentially exploring an abandoned factory, or some such area. There are some pretty clever puzzles to do with switches and water and so forth, but it feels much more static. It doesn't feel like the world is alive and out to get you any more, it's just like there are a bunch of sharp edges that happen to be sitting around, which you may or may not impale yourself upon. My final issue is with the puzzles themselves. Above I said that they are all pretty well made. Challenging without being too hard, clever blah blah blah. That's all true, except for one part of the game near the end. At one point you come upon some puzzles using a gravity mechanic that feels very much out of left field. They take place right near the end of the game, and all of a sudden you are being thrown up against an entirely new mechanic and, in my opinion, not given anywhere near enough time to be shown how exactly these mechanics work before you are expected to solve their associated puzzles. They aren't hard so much as they are out of place. They are cool mechanically, but given their complexity they should either not be there, or they should be introduced much more gradually. 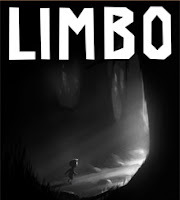 Now that I've done my usual "spend 10 seconds at the start praising the game and then the rest of the article complaining non stop", I must say that Limbo is definitely a very interesting game. Despite my complaints, the game never really missteps too badly so as to be not fun. Of course if you are looking to be rewarded for your cleverness or given... well any information at all, really, then Limbo is probably not where you want to look. If you are looking for a well put together puzzle platformer that is full of mystery and carries a very striking aesthetic, then look no further. Well I mean, you can look further I guess, but buy Limbo and THEN look further.